Duke University awarded degrees to 441 undergraduate and graduate engineering students on Saturday and Sunday, May 9 and 10, in ceremonies that began with diploma ceremonies for professional masters degree students, continued with a university-wide commencement exercises at Durham Bulls Athletic Park and included Pratt School of Engineering celebrations at Cameron Indoor Stadium. Adding to students who graduated in September and Fall of 2014, this brings the total engineering Class of 2015 up to 644. Watch the 2015 engineering diploma ceremony. Humanitarian and 1982 Duke graduate Paul Farmer delivered the University’s commencement address, while Pratt Dean Tom Katsouleas and Morgan Simons, senior class president, spoke at the undergraduate engineering school ceremonies on Sunday. Students Lian Liu, Bradley Echols, Igor Tregub and Joel Ayala addressed the MEM and MEng graduates at the Diploma Ceremony on Saturday. Katsouleas awarded Bachelor of Science in Engineering diplomas to 285 students (295 total for the Class of 2015). He also presented diplomas to 63 Master of Science and 32 PhD engineering graduates (a Class of 2015 total of 106 and 66 total, respectively). 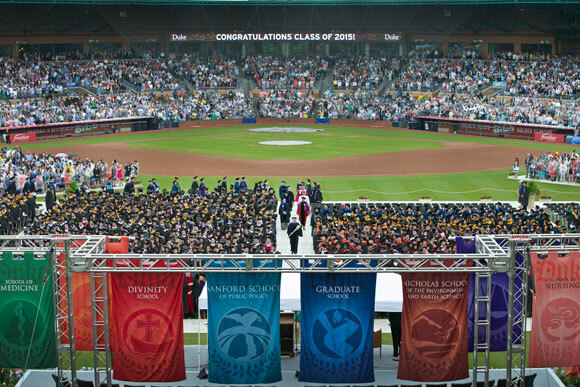 Watch the 2015 Master of Science degree hooding ceremony. Forty-three Master of Engineering Management and 18 Master of Engineering degrees were awarded on May 10 (total graduates of those programs for the academic year, including September and Fall 2014, were 137 and 40, respectively). Watch the 2015 MEM hooding ceremony and the 2015 MEng hooding ceremony. Overall, Duke awarded degrees to about 5,100 undergraduate, graduate and professional degrees to students who are graduating this spring. Students who graduated in September or December 2014 were invited to participate in Sunday's commencement. The Pi Tau Sigma Scholarship Award in memory of T.C. Heyward, Sr., is presented annually by Pi Tau Sigma to an outstanding senior in Mechanical Engineering at Duke University. Selection is based on academic excellence, engineering ability, and leadership, and is chosen by a committee of the engineering faculty.